Collaboration for better business productivity. Micro Focus Vibe® (formerly Novell® Vibe) brings people, projects, and processes together in one secure place to enhance team productivity – no matter where the team is or what devices they use. Keeping your employees informed through an Intranet is one of the first steps towards business success. Augment or replace existing internal websites with a social and collaborative Intranet that improves users' awareness and contribution with Web 2.0 technologies. Team workspaces let you create digital offices where local and global team members can gather online to coordinate their efforts and bring together the right information, resources, and skill sets for a project, purpose, or topic. They can take advantage of all of Vibe’s collaboration and productivity tools. Personal workspaces let you create your own online work environment. Similar to team workspaces but customized to your own needs, personal workspaces give you control over private and public elements in your workspace. 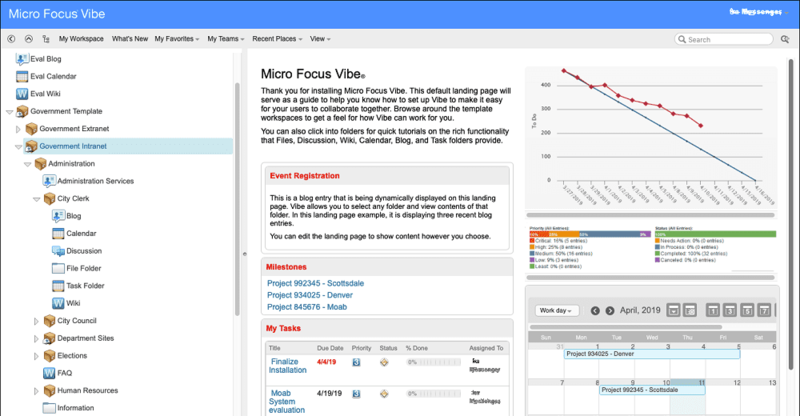 Vibe was originally implemented in 2012 to replace an aging intranet portal. A year later, Vibe helped new employees make a seamless transition in only one day. Vibe provides a 'company home page' to help streamline operations and foster better connections between staff. Primary Care Trusts (PCTs) and Care Trusts across England were grouped into clusters with some sharing of management teams and board members.